This is a sponsored post written by me on behalf of Chiquita Banana. All opinions are 100% mine. Hi guys! One of my favorite comfort foods in the whole world is banana bread. I mean, not to toot my own horn, but I did win a prize in the New Mexico State Fair for my mom's my banana bread when I was a kid, so . . . toot,toot. Aaaanyway . . . I love banana bread. So when I found out that there was another way I could try to win a prize for cooking with bananas, I was all in. 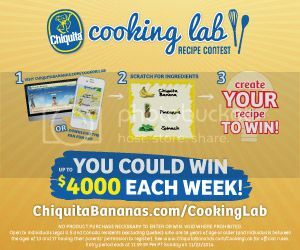 The Chiquita Cooking Lab Recipe Contest sounds like so much fun and you can enter, too! Each week from September 29th to November 4th, three secret ingredients are announced. That's when you get your creative juices flowing and come up with a unique recipe that features those ingredients. One winner will be chosen each week to win $4,000 and have their recipe turned into a stop motion video and promoted on Chiquita’s digital and social channels. Four random winners will also be chosen weekly to receive a Chiquita gift bag. Sounds like fun, right? Enter your recipe here! This week's secret ingredients are Chiquita Bananas, Pears and Cinnamon. I used the bananas and pears to make a batch of Banana & Pear Sauce, which is similar to apple sauce only waaaay yummier! Then I used the Banana Pear Sauce as the basis for the most deliciously moist spice bread I have ever made. Because I love y'all so much, I'll share the recipe! Place chopped pears, sliced bananas, apple juice, lemon juice, vanilla and ground ginger into a large pot. Bring to a boil over medium heat, stirring often. Simmer 25-30 minutes until pears are soft and bananas have practically melted into the liquid. Remove mixture from heat and allow to cool. Place cooled mixture into a blender or food processor and puree until desired consistency. You could stop right here and be perfectly happy with yourself, delighting in a bowl of this yumminess. It has the "grainy" texture of an applesauce or a fresh pear, but the bananas add a creaminess that is unbelievable. Don't worry, You will have extra Banana & Pear Sauce to eat on it's own after you make your bread . . .
Preheat oven to 350 degrees. Heat 1 1/2 C. of Banana & Pear Sauce into a small saucepan with the cinnamon. Stirring continuously, cook over medium heat until pear sauce becomes steamy and begins to thicken -- about 3 minutes. Transfer to a mixing bowl. Whisk in water, then brown sugar, then eggs until smooth. In another bowl, whisk together remaining dry ingredients, then fold into banana pear mixture until just combined. Scrape batter into 3 greased mini loaf pans or 1 greased 9" loaf pan. Bake until firm and golden brown -- about 50 min. for mini loaves or 70 min. for large loaf. Turn onto a wire rack and cool to room temperature . . . if you can wait that long! We are impatient so we usually eat ours warm with a smear of butter and a side of ice cold milk. It's also yummy if you put the Banana & Pear Sauce on top of the bread instead of butter. For more recipe inspiration check out: #ChiquitaCookingLab on Pinterest and #ChiquitaCookingLab on Facebook.